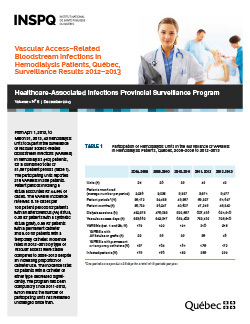 From April 1, 2012, to March 31, 2013, 42 hemodialysis units took part in the surveillance of vascular access–related bloodstream infections (VARBSIs) in hemodialysis (HD) patients, for a combined total of 51,697 patient periods. The participating units reported 218 VARBSIs in 209 patients. Patient periods involving a fistula accounted for 44.9% of cases. The VARBSI incidence rate was 0.19 cases per 100 patient periods for patients with an arteriovenous (AV) fistula, 0.26 for patients with a synthetic fistula (graft), 0.55 for patients with a permanent catheter and 5.06 for patients with a temporary catheter. Incidence rates in 2012–2013 by type of vascular access were stable compared to 2008–2012 despite an increasing proportion of catheter use. The incidence rates for patients with a catheter of either type decreased significantly. The program has been compulsory since 2011–2012, which means the number of participating units has remained unchanged since then.